There’s a saying that life is a journey – ain’t that the truth? My own career journey started 33 years ago at General Motors Corporation as a young, eager and very naïve intern. Since then, it’s taken me through at least ten major US metropolitan areas, to a huge European agency, into Canada, and through some of the world’s largest advertising agencies. I’ve gone from computer operator to project manager to account lead to agency CEO – and have done pretty much every kind of marketing along the way. Each step on the path has had a lot of learning and growing, personally and professionally. For all of this, I am truly grateful. Today that path has taken me someplace new and very exciting. I’m tremendously pleased to announce that I will be joining Spring Creek Group, the social arm of the Interpublic agency Mediabrands, as Senior Vice President of Social Strategy. Effective June 28th, I’ll be joining Spring Creek founder Clay McDaniel, buddy/former #SMCSEA president Kevin Urie, and others, managing the social strategy and planning team, and helping spread the Spring Creek brand across the planet. Those of you who know me well know I’m a creative, an experiencer, and an explorer at heart, and this is a great chance for me to get back into creative development, to work more globally, and to innovate with new social campaigns for major brands. And excitingly for me, I’ll be leading a team again – helping others develop and grow on their own career journeys. I’d like to thank Ant’s Eye View and CEO Sean O’Driscoll for the chance to work with them over the last year and a half. Sean has built an amazing team of super-talented people, and the thinking, client list and horsepower of AEV is pretty stunning. Sean continues to be the best sales person I have ever met, and in my time at AEV, I really had to step up and bring my best game. I will miss my coworkers and clients, and know they’ll continue on their enviable success curve. 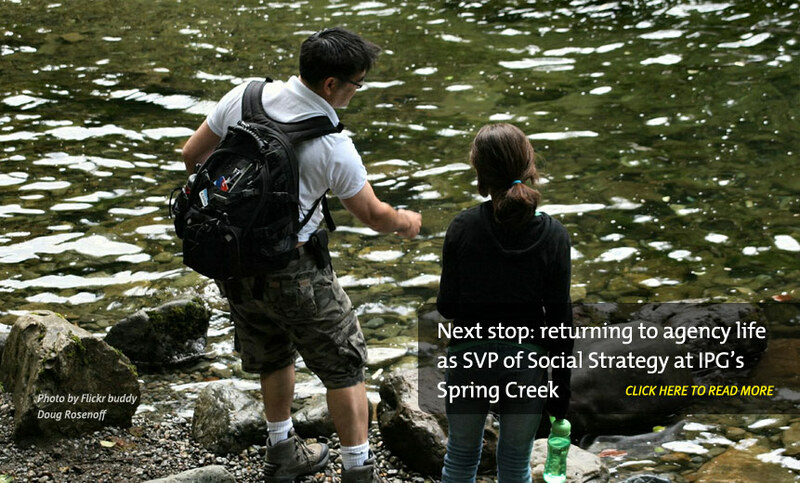 You can follow the Spring Creek Team on Twitter, Facebook and LinkedIn. Homepage photo of me and daughter Caroline by Seattle Flickr buddy Doug Rosenoff. Thanks, Doug! Extremely excited to have you as part of the team and to get to work with you Eric! Welcome to SCG!